A wooded, lakeside community, Wolfe's Bay has a population of about 13,000, which doubles in the summer with seasonal residents. The town is also home to Hart College, a small liberal arts college with strong programs in history, literature, and ecology. 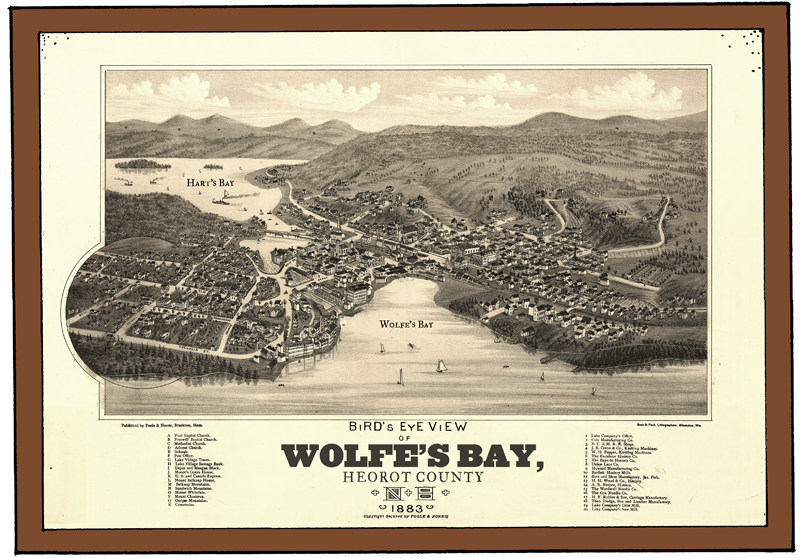 Wolfe's Bay is named after the first white settler to the region, Benjamin Edward Oscar Wolfe, and is the county seat of Heorot County. It is home to legends about sasquatch, ghosts, strange disappearances, and other unexplained phenomena. A bit of a reluctant hero, Brian Wegman is in his last year of doctoral studies in paleoanthropology. At least, he hopes it's his last year. His advisor's breathing down his neck and he's trying to finish his dissertation, but he's not having much luck. On top of it, his students are walking all over him. He accepts an offer to consult with the Wolfe's Bay sheriff department to try and get a new perspective on things. Gary Roth is a longtime friend of Brian's father who calls him in to consult on a mysterious homicide investigation. A former NYPD detective who moved to the country to raise his family, Roth is a pragmatic, often sarcastic sheriff. He's quiet, somewhat matter-of-fact, but extremely observant, and he has his own theory about what's killing the spring breakers out in his woods. And Brian's not going to like it. Winifred is the sheriff's daughter. She is a folklorist and a recently hired professor of comparative literature at the local college. She is whip-smart with a sunny disposition and an affinity for science fiction novels and pop culture. Her doctoral dissertation? "The Cultural Memories of Trolls and Elves within the Youth Population of Iceland." She has accepted that nobody will ever read it. Winifred's expertise proves invaluable to the investigation at Wolfe's Bay. Chief Deputy Anton Asher is Sheriff Roth's right-hand man. A friendly, trustworthy officer and long-time family friend, he supervises the deputies and oversees criminal investigations. Asher is a bit of a Trekker; he and Humphries debate about Star Trek in their down time. Chris Humphries is in charge of the forensic investigation at the crime scene at Wolfe's Bay. A naturally skeptical man with a sour attitude, he distrusts Brian and Winifred's lack of "real-world" experience and thinks they're both a couple of nerds. To him, field experience is everything.